The AA had already spilled the grim news – the reason the lady’s very smart hatchback suddenly no longer ran appeared to be a failed cam belt. Off the recovery wagon, into our workshop and partly stripped down – the AA were dead right. 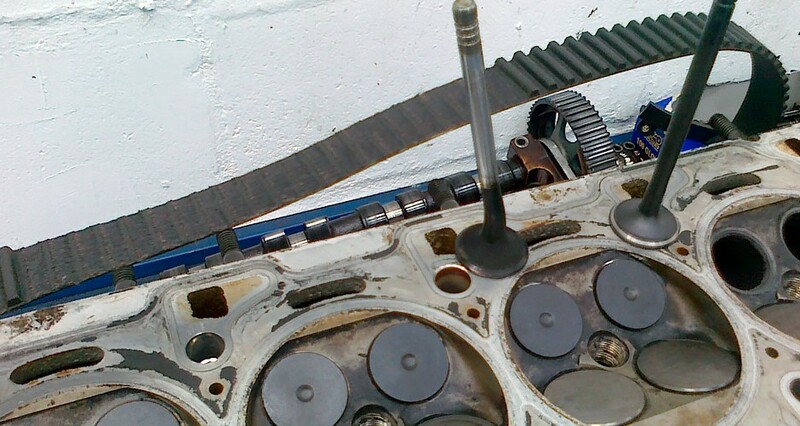 Later, with the whole top of the engine laboriously removed the full extent of the damage, caused entirely by lack of scheduled maintenance, was apparent: 8 bent exhaust valves and an over-age cam belt that had lost several teeth (so causing the valve timing to go catastrophically wrong). She was lucky in that the pistons had somehow survived the collisions and no valve heads had broken off to destroy the engine. This little engine was repairable; many are not… A week and nearly £730 in parts and £450 of labour later in this particular case (even at our low labour rate) and it’s all repaired and running well again. A lesson learnt the hard way sadly. In hindsight the disaster was both preventable and entirely predictable – the last time it had seen the inside of a workshop had been for a “budget service” elsewhere 12 months ago which, although inexpensive at the time, ignored the car manufacturer’s crystal clear age/mileage change schedule for the critical belt – a blatant false economy if ever there was one. The reason we don’t state exactly which hatchback was involved is that the tragedy could equally well happen to almost any engine out there today, petrol or diesel, that runs with a toothed belt rather than a chain (circa 80%) so do check your maintenance schedule now or call us to do so for you. We have a technical database and can usually advise within an hour. Ignoring a routine service job costing a few hundred pounds could abruptly turn into a written off engine, or even consequently car. Remember – prevention is always cheaper than cure when it involves cars.